I remember so well the first day I set eyes on you. It was at the rescue shelter in Sault Ste. Marie, Ontario on Dec. 28, 2009. There were only five dogs in the shelter that day, and you were in the very last cage, sitting with your ears pinned back and your little green stuffed animal in your mouth. There was something about you that I immediately fell in love with. I know it sounds strange but I could tell by your eyes that you were a very special dog. But, the sign one of the staff pinned to your cage while I was standing there suggested otherwise. It said, “Returned… too much”. In fact, you’d had three failed adoptions since you’d been picked up as a stray by the dog catcher. It should have scared me off but it didn’t. I never expected to get a dog that Christmas, however, two days earlier, Antonio had announced to his staff that he would be coming home with a dog. He didn’t know how… just that it would happen. When we’d talked about a dog, we’d always agreed that we’d get a young pug, female, and spaded. 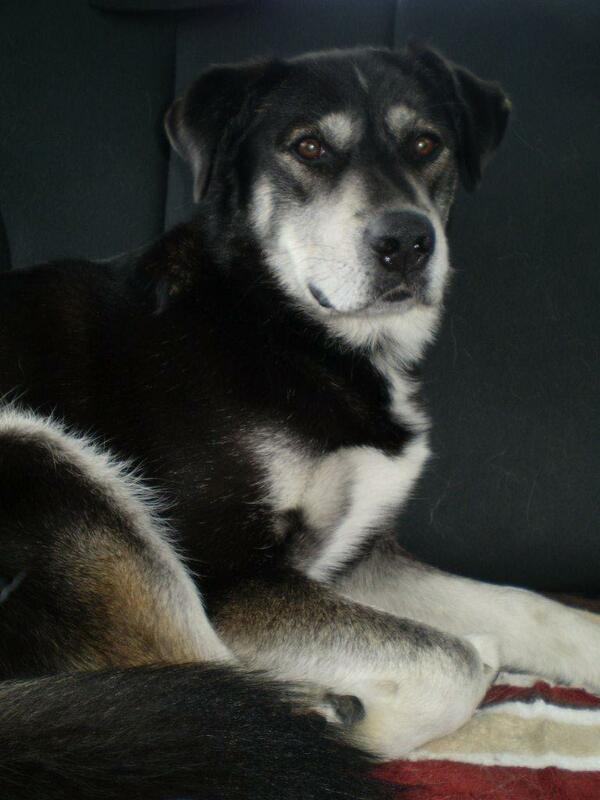 You were an older husky, shepherd, lab mix, who eventually grew to be 80 lbs, male, and not neutered. You were an ‘anti’-pug… but I couldn’t get you out of my mind. When we returned to the shelter the next day, you were alone in the yard, standing by the fence, silently watching us approach. I crouched down by the fence to look you in the eye and you responded by lowering your head to the bottom of the fence, pushing your nose underneath as far as you could, and licking my hand. I wept. It was official. You were ours. The shelter had named you ‘Bullet’, for the vertical, bullet shaped marking on your forehead, but I impulsively knighted you Max. I had no idea how fitting that name would turn out to be. 3 1/2 months after we adopted you, my Dad died, and we put you into a boarding kennel in the Sault for a few days while we flew east for the funeral. We were surprised when the girl at the front desk recognized you. You looked healthier, happier, and heavier than she remembered but she was certain you were the dog she had nicknamed ‘Bolt’. Since you had been a stray, this was the first information we had received about you other than the veterinarian’s estimate of your age. We learned that you’d been owned by an alcoholic who had mistreated you, and that you would routinely pull a ‘Houdini’, getting out of your collar, and making a run for it. Somehow you always returned. On one such occasion, the girl from the shelter had taken you in for a few days but you eventually bolted from there too. We were shocked to learn that French was your native ‘tongue’, which explained a lot of the communication hurdles we encountered in the beginning. I can only imagine what it must have been like for you… escaping from your abusive owner for the final time, being adopted by your fourth family in two months, taken to a new community four hours away, and then spoken to in an entirely foreign language. But I was right that you were a very special dog. You never barked, never went near the garbage, never got into anything, and never destroyed anything. You were unbelievably careful and gentle whenever we you would take a treat from us and, despite your abusive past, you were unfailingly kind and gentle to everyone and everything. Our biggest challenge was training you to walk beside us properly on a leash. The progress was slow but sure, and the whole community watched, noticed, and cheered you on. We walked you three times a day, and you became famous in town. Everyone thought you were a puppy because you had such a puppy-like quality about you. They thought you were beautiful, with a beautiful personality, and you were. You were a truly beautiful dog. It was a rare day that you didn’t make us laugh, whether it was the Elvis curl of your lip when we were playing hide and seek, the way you would bounce down the hallway when we were playing with you, your happy dance and showgirl wiggle when you knew we were going for a walk, or your unbridled elation when we would give you a special treat, like a Dentabone or an egg. I loved how we would stand side by side when Antonio left for work and, as soon as the door closed behind him, we would look at each other for a moment and then you would literally skedaddle down the hall ahead of me to the livingroom, where you would retrieve your beloved cow puppet (complete with a clicker for mooing noises) and we would play tug of war or chase the cow. I loved how you would jump up on your couch all excited for a cuddle. I loved how you would routinely bump my hand, leg, or back of my knee with your nose while we were walking, for no other reason than to connect. I loved watching your crooked run when we would walk through the trails in the woods during the winter and you were off leash. I loved how I would round a corner in the trail to find you stopped ahead, silently watching to make sure I was keeping up. I loved your crazy, mental run you would sometimes do to let off steam. And I loved how, if I stopped to pet a dog, you would silently but unmistakeably position yourself between us, in a passively possessive move reserved for only me. I loved how, if I put something special in with your food, you would start to eat and then stop, come over and bump my hand with your nose to say thanks and then go back to finish, I loved how you sometimes would walk into the middle of the yard and then fall to the ground as if you’d been shot, writhe around like a crazy dog, and then stop and tilt your head backwards to see if I was watching. I loved how much you loved the car, always stopping at the beginning and end of a walk to flip your nose at the back door, in the hopes of an inpromptu drive. I loved all the times you’d move up from the backseat to perch on the console between the two front seats, looking out the windshield, pretending you were a human. But, what I loved most of all was how much you loved to be with us. Your favorite thing was to be with us, no matter what we were doing. In the beginning, you were so wary of hugs and cuddles but I persisted with them nonetheless. Before long, you would seek them out. I soon added kisses to your cheeks. I especially loved how you would completely collapse against me with all your body weight and just enjoy the companionship and joy of being pet. I loved how you could read our moods, and the many ways you found to cheer us up. It was impossible to be mad at you for any length of time because you would totally charm your way out of it. My favorite memory was one day near the end of March, when we picked Antonio up from work in the car immediately after your walk. I was recounting your transgressions, and you leaned forward and started licking the snow from my hat. It was the first time you’d ever done such a thing, and it completely disarmed me. Antonio and I dissolved into laughter, you bumped my arm with your nose and, just like that, we’d made up. There’s so much more I could say but, like all good things, this letter must come to an end. Like all good things, our time together had to come to an end. But, like many good things, we never saw the end coming. You became so ill on Good Friday and we were certain it was temporary. After all, you were only 7. But, when Antonio took you for a short walk that morning and you laid down on the street – on your side no less – and Antono had to carry you the 2 blocks home, we worried even more. We were so relieved when we finally found a vet who would take you in on Easter Sunday. I’ll never forget Easter Monday afternoon, when the veterinarian called our cellphone and asked how soon we could get to her office. I’ll never forget looking at the x-rays where the barium showed the huge intestinal mass that was crowding your intestines to the back half of your body. Food couldn’t stay in and waste couldn’t come out. And I’ll never forget the realization that you weren’t going to be ok, that you weren’t going to be coming home, and there wasn’t anything more we could do. My heart broke in two at that moment. I felt indescribable pain and sorrow. Devastation is an inadequate word to explain the heartbreak. 2 years, 3 months, and 6 days. That’s all the time we had with you. But, I thank God that we had even that much time together. I thank God for what you taught me about loving life, unconditional love, joy, kindness, and humor. I thank God that the first 5 years of your life might have been hell but that we were entrusted with the gift of giving you as much Heaven on earth as we could for the time remaining.